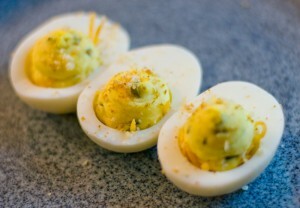 Deviled Eggs are a quintessential Super Bowl appetizer. Recently we participated in Hickman’s Family Farms Perfect Game-Day Snack Deviled Egg Contest. Chefs and bloggers around the Valley competed to make a football themed deviled egg recipe. The winner won $1000 for the charity of their choice. We didn’t win (the winner was Chef Adam Allison of SuperFarm SuperTruck) but we did have a lot of fun and came up with a recipe that we think is pretty fantastic (You can see all of the competitors deviled egg recipes here). With Sarah being the football fan in our dynamic duo, we went with her favorite team, The Chargers. 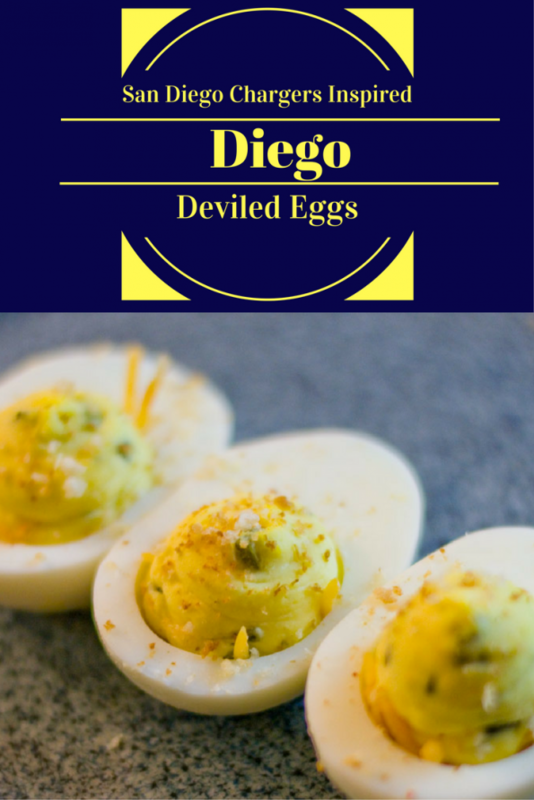 Our deviled eggs were inspired by Qualcomm Stadium’s Diego Burger, “a burger boasting American cheese and a fried chile relleno, plus all of the traditional fixings – lettuce, tomato, onions and pickle chips.” We wanted to bring a bit of San Diego to our eggs without being too literal or too cliche. So without further delay we are proud to share our first food contest entry! We hope you enjoy it as much as we enjoyed creating it! 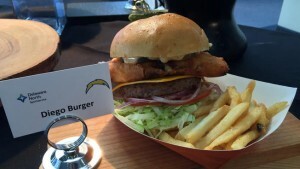 Maybe next season we will be able to serve it at a Super Bowl where the Chargers are actually playing! Hint hint boys! Hard boil eggs using preferred method, cool, and then peel. Set aside. While eggs are cooking, grill or broil poblano until skin is charred and blistered. Allow to cool, then peel, de-seed and finely dice. Toast panko until golden brown. Remove from heat into a small bowl, add cumin and a pinch of salt. Stir and set aside. Cut eggs in half and separate yolks into a mixing bowl and whites onto the serving plate. Divide cheese among egg whites. Combine egg yolks, mayo, mustard, poblano, and salt to taste. Mix until creamy. Top with panko bread crumb mixture. *The Geeks were given comped items in order to participate in this contest. View our Disclosure Policy for more info. ← Previous Previous post: Southern Rail Brings NOLA to PHX for Mardi Gras! Thank you for sharing at #RecipeSharingParty. Pinned and Yummed!